As a special highlight, Kramer-Werke GmbH presented an all wheel steer loader, the KL60.8, for the first time at Agritechnica 2017. The product portfolio in the wheel loader sector reaches new heights with this loader. The package consisting of powerful load-sensing hydraulics, innovative drive system and the time-tested and proven Deutz engine make the new Kramer wheel loader into a good selection for the discerning farmer. The new Kramer flagship is driven by a 100 kW Deutz TCD 3.6 engine of the exhaust emission level IV. The exhaust aftertreatment occurs via DOC and SCR. 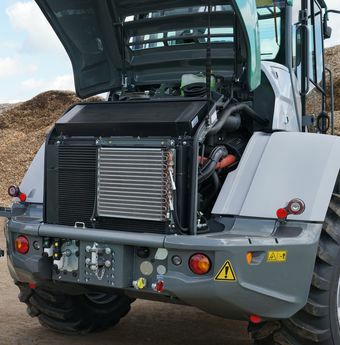 The even more powerful Deutz TCD 4.1 with 115 kW is optionally available to the customer. The exhaust aftertreatment here occurs via DOC, DPF and SCR. A special innovation optionally used for the model is the new hydrostatic, wide-angle drive system ecospeedPRO with 370cc capacity for increased tractive force and driving dynamics. The variable hydrostatic high-speed gearbox with a 45° turning angle of the hydraulic motor was co-developed by Kramer. In addition to the positively known properties for hydrostatic drives, such as easy reversing, good metering, fine controllability, inching and brake force support, the large conversion range of the 45° technology also allows for driving through the entire speed range from 0 to 40 km/h without shifting and thus without losses of thrust or tractive forces. 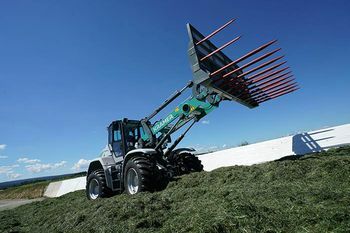 In typical agricultural working situations, such as handling work in the Y-cycle, there is a high demand for constant thrust and tractive forces at low speeds. The ecospeedPRO transmission meets precisely these requirements by completely eliminating shifting steps. In turn, this offers a very high level of driving comfort, since there is no tractive force interruption or shifting jerk. This offers comfortable uniform driving for the end user and a harmonious noise development. The intelligent engine speed reduction "Smart Driving" is integrated in the ecospeedPRO drive system as a standard. This optimally adjusts the engine speed to the driving requirements at a constant speed. When reaching the maximum speed, this ensures reduced noise level, a lower fuel consumption and a reduced load on the individual components. With ecospeedPRO, it is possible to reduce the engine speed to 1,550 rpm at maximum travel speed. Quick and powerful work cycles are the rule with the 150 l/min or 180 l/min (option) load-sensing hydraulic performance. Depending on the customer requirements, an extended loader unit with a bucket pivot point of 4,200 mm is available as an option for the standard loader unit with a bucket pivot point of 3,765 mm. Of course, an extremely sturdy hydraulic quickhitch facility is offered here for the harshest applications with a 61.5 mm wide support as well as a 50 mm thick lock pin. The variety of attachments makes the wheel loader perfect for flexible application in agriculture. The machine is extremely versatile in use, whether for feeding, stacking straw or mucking. There will also be a telescopic wheel loader in this size class for even more flexibility. The standard equipment is already very extensive and, in addition to the 7" LCD display, air conditioning and automatic bucket return, it also includes a reversible fan, four work lights and a Bluetooth radio with USB 2.0. In addition, the model meets the requirements of the new EC tractor directive. The package consisting of powerful load-sensing hydraulics, innovative drive system and the time-tested and proven Deutz engine make the new Kramer wheel loader KL60.8 into a good selection for the discerning farmer. As usual with Kramer, the vehicle can be adapted to individual requirements through a variety of performance options. In addition to the impressive performance features, the KL60.8 also impresses with a completely new cabin and operating concept. The cabin concept with ergonomically arranged operator's controls offers fatigue-free and efficient work thanks to the excellent all-round visibility. The 7" large LCD display with integrated reversing camera offers the operator useful operational and consumption data. The associated jog dial control element makes an intuitive operation of all functions possible. Interested? Simply fill in the form and we will contact you.